The rose Mermaid was bred in the United Kingdom prior to 1917 by William Paul and Son. William Paul established his nursery in Waltham Cross, UK in 1860 and his sons took over the operation and continued breeding roses after he died in 1905. 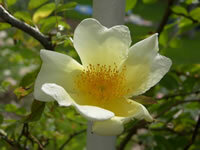 The Mermaid was created by crossing a Rosa bracteata JC Wendl and a tea rose. The result of that crossing is a huge climbing rose that produces large light yellow blooms that fade to white as they age. Mermaid roses will grow anywhere from 15 to 25 feet tall and will spread out to widths of about 20 feet across at full maturity. The blooms on the rose Mermaid will be single blooms with just a few petals, about 4 to 8, and they will average around 5 inches in diameter with a mild fragrance. The Mermaid is a very thorny rose as it grows and it lends itself well to a wide variety of supports, just make sure that you wear your gloves when you tackle this rose. The Mermaid will grow very well in zones 6 and warmer. The rose Mermaid is a very vigorous grower and it is even shade tolerant which makes it highly versatile in the garden. You can train this rose to grow up any support and some gardeners even use it as a hedge rose and trim it back with electric trimmers. 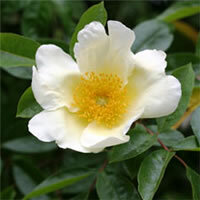 The Mermaid is highly resistant to diseases and has proven to be a hardy rose even in the northern, colder climates, making it a favorite among the new and experienced gardeners alike. Mermaid roses are continual bloomers and while some gardeners say they are among the last of their roses to start blooming, they also have a knack for blooming straight through until November. Choosing the right location for your roses is always one of the most important decisions you will have to make. Roses do their best work in locations that receive a lot of direct sun light, even the shade tolerant varieties such as the rose Mermaid. Try to find them a spot that gets at least 6 to 8 hours each day of sun light. Morning sun light is even more preferable to help burn away the morning dew that clings to the leaves. When you are ready to plant the rose Mermaid, you should make sure that you are providing it with soil that drains well, but is still capable of supplying the plant with adequate moisture and nutrients. I always suggest in my planting articles that you take a trip to your local garden center and pick up a bag of organic compost. This stuff is usually cheap and makes a great soil amendment for roses especially. When you dig your hole, mix in the compost at a ratio of 2 parts soil to 1 part compost. Your roses will thank you for it. How you plant your Mermaid roses depends a little on how and where you bought them from. If you picked them up locally, they were probably already planted in nursery containers and ready to bloom. These are real easy to plant. Dig yourself a hole that is at least twice the diameter of the container and equally as deep. This will give you ample room to surround the rose Mermaid with plenty of your new soil mix, while still keeping the bud union at the same depth it was originally planted. If you ordered your rose online, then it was most likely shipped to you as a bareroot plant and gardeners are often intimidated by these, but there is no reason to be. They are not difficult to plant. Start off my soaking your bareroot rose Mermaid in a bucket of lukewarm water overnight to rehydrate the roots. Then dig yourself a hole that is wide enough to fit all of the roots naturally without forcing them. Also dig the hole deep enough so that you can set the plant on top of a mound of soil in the center, and still keep the bud union about an inch or two below the soil once planted. Once you have set your rose Mermaid in place, back fill the hole about halfway to start using your new soil mix. Take your garden hose and water the soil heavily until it flows like mud, then go ahead and back fill the hole the rest of the way. What you are doing is ensuring that the roots are completely covered by the soil and no air pockets have formed below the surface. Caring for the rose Mermaid is pretty easy and all you need to do is follow a few basic rose bush care guidelines to have a successful growing season. 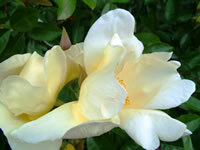 First, you have to make sure that your roses get ample water, but at the same time you do not want to over water them. A good rule of thumb is to give them one deep watering each week. You can also feed your Mermaid roses with a good all-purpose granular fertilizer in the early spring when the leaves begin to bud. Since this is a repeat bloomer, it will benefit greatly from additional feedings. I will usually give my roses a second feeding just as the first big bloom starts to form, and then a third one around mid summer to help encourage more blooms later in the season. If you are going to prune the rose Mermaid, it should be done in the early spring and a light pruning is sufficient, if any is needed at all. You should take the time every spring to clean out around the base of your roses, especially when there are dead leaves and debris laying around. Letting decaying matter lay around the base of your plants is an open invitation to many pests and diseases. Throw this material out with the trash, never toss it into the compost bin as some spores will survive even the cold winter months to reinfect the plants the following spring. I always finish up my spring pruning by giving my roses a generous layer of mulch.